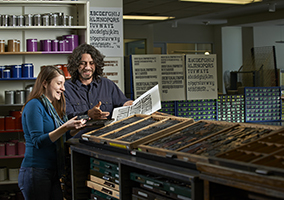 A Book Arts Minor is awarded upon completion of four core book arts courses offered through the Department of Art and Art History and an additional two elective courses selected from the elective list. Alternatively, a student can opt to take five core book arts classes and one elective course. Students can take 3000-level courses in the order that works best for their schedule— there is no prescribed sequence. Please direct questions regarding the Minor to the faculty mentor for Book Arts, Marnie Powers-Torrey: marnie.torrey@utah.edu. To declare a minor, schedule an initial advising appointment with College of Fine Arts advisors by emailing advisor@finearts.utah.edu. Students can opt to take a fifth course from the core courses instead of a second elective. Students can take one course from ART 3066 or BART 3066. Link to Book Arts Minor in University of Utah General Catalog here.